No matter what professional background you have or which roles at Linde Material Handling interest you, with us, you have the chance to learn about an exciting and dynamic environment, and to work in a variety of corporate divisions. Help to shape the company in the long term as a team player working with more than 10,000 colleagues around the world. 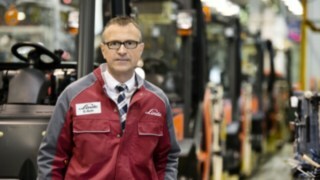 When it comes to the future of intralogistics, we are committed to leading the way. Would you like to join us? In order to develop suitable solutions and products for our customers, we value your perspective and your skills as a talented employee. We know our success is built upon the varied expertise and willingness of our workforce. Which specific qualifications and skills you bring with when you when coming to Linde differ according to the requirements of the position being advertised. The level at which we are able to perform is based upon the know-how and motivation of our employees. In order for them to develop and practice their skills, we provide a wide range of further professional development and individual qualification opportunities: We support our employees' ability to quickly rise to new challenges, with numerous seminars on methodology, foreign languages, and specialist knowledge areas. Furthermore, we offer a wide variety of further technical training, such as the popular forklift driver’s license, or special training courses such as managerial training. 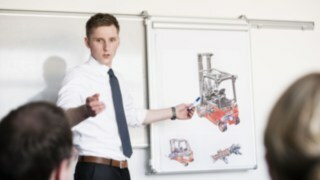 However you want to shape your career at Linde, the direction and the speed are in your hands. As a responsible employer, your health and safety is paramount to us. Linde therefore implements a Health, Safety and the Environment (HSE) policy worldwide. We train our employees for their safety and also react to demographic change, by offering flexible partial retirement models, jobs geared to the needs of an age-diverse workforce, and internal health programs, so that you can continue to work to your full capability. Networking isn't just about our trucks and solutions. Networking also plays an essential role among our employees worldwide since, as a global company, we work across borders and functional units. Thus we share our knowledge around the world and complement each other. For example, specialist functions are temporarily filled by experienced employees until a local successor can be found and trained. Our operational models are diverse: We offer postings of at least one year to a foreign Linde corporation, business trips of up to three months, prolonged business trips of up to six months at most, or a long-term change of working location. Thanks to modern communications technology we build transnational virtual teams, who work together on projects and are therefore also a part of Linde Mobility. Cover letter: Tell us about your personal experiences, aims and reasons for wanting to work at Linde. Copies of certificates: Please provide evidence of your experience so far with copies of your degree and work certificates. To find out how to apply for an advertised position in a particular field and site, please refer to the careers section for the country in which you would like to work. After submitting your application we will review your documents internally, which can take some time depending on the number of submitted applications. If we are interested in you, we will invite you to an interview. If you don’t find any vacancy that interests you currently listed, you are welcome to submit an open application. We are always looking for employees who want to help us drive the company forward. Find out more about the possibility of an open application in the careers section for the country in which you would like to work. Please remember to include with your application your availability, your desired field, and your salary expectations. We will process your application as quickly as possible and get in touch with you. Do you have general questions about a career at Linde? Please get in touch using the form below. If you require more information about a particular position, please direct your query to the contact given in the relevant listing. We will get back to you as quickly as possible.